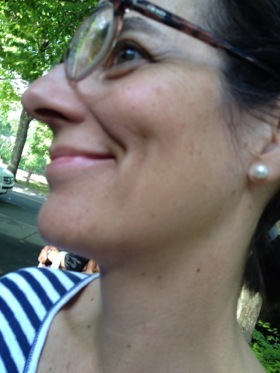 Over the summer, I finished writing a personal essay on my experiences with head lice. As part of that process, I researched and read way too much about Pediculus humanus capitis, a parasite that feasts on human blood and causes incessant itching. I also wrote about times, which I thought were past, when lice descended on our house. Well, the past has become present, and I’ve had to confront some fresh cases of infestation. This time, though, I feel no panic, because I see lice and I know what it takes to get rid of them. I’d like to share what I’ve learned with readers who may be confronting head lice on their children’s heads for the first time. What works? Of the over-the-counter pesticides, home remedies (olive oil, vinegar), and homeopathic potions, the only one that I’ll stand by is Licefreee!®, which is a gelled salt. It goes on goopy and sits on the head, covered with a shower cap, for at least an hour. I comb it out — yank, really — with the special stainless steel comb. Salt is a dessiccant and seems to severely weaken the lice, their nymphs (newborns), and nits (eggs). The action of the comb is the coup de grâce, dislodging them abruptly and permanently from their host. After treating the child’s head, get her out of her clothes and put them all into a hot wash and dry. Take off your own shirt (a few flung lice are probably clinging to it) and throw that in, too. Wash sheets, pillowcases, and blankets. Forbid children to trade hats, wigs, fleece pullovers, and dress-up clothes. A friend, partner, or spouse who is not handling the nit-picking can help by entertaining the child undergoing the treatment. Jimmy recently taught Grace how to play a mean game of chess while I stood above her head, combing out the gel and repeatedly checking and rinsing the comb. If you feel overwhelmed by the problem and are considering hiring a professional to help you, look here for The National Nitpicker Directory. I haven’t resorted to this yet, but if lice return to our house during the school year, and I have a stack of papers to grade or a deadline to meet, I just might call The Nit-Picker, or someone like her. Our family has had only one run in with head lice and it was amazingly traumatic for us. Your experience and eloquence is very impressive. I admire your courage and determination. Oh, memories. I had it once. But every school year, the school nurse would walk down the aisles of my classroom and check each one of our heads. I was always terrified that she would find lice in my head–if lice was found on a child, the child (and siblings) were sent home. How mortifying. I’m glad you’ve written this for other parents and caregivers–part of the fear was always how many and unstoppable they seemed. Brian, I had never thought of it as “courage,” more like doggedness, kind of like what it takes to pay down debt. You have elevated my task — thank you! girldogtorch, I’ve had it, too, as a child and as an adult, too. I am determined to end the ridiculous mortification by handling this in an open, matter-of-fact way. Having lice is as morally neutral as having the common cold. Or, it should be. Doggedness can require courage, not to mention your own power source. The detail here is informative, but overwhelming. I’m exhausted. I would utter “Wow,” if only I could muster the strength. There are studies that indicate Cetaphil is also a good, dry on, effective treatment for lice. See this link to the research. Thanks for the citation to the paper. I read it, and the research is convincing. I did a little more reading, to find the connection between “Nuvo” lotion and Cetaphil, and here it is, for readers who are interested: http://pediatrics.aappublications.org/cgi/content/full/116/6/1612 Basically, parents can use Cetaphil cleanser (*not* lotion) in a series of steps to treat head lice without excessive combing and nitpicking. Hey, if this works, it’ll be revolutionary! It can even make the treating of one’s self for head lice — which I have done — more effective. I agree with the Licefree comments. I’ve used it for 8 years and think it’s the best thing out there. It actually kills. We live in an area that seems to have an outbreak about every 6 months. Luckily my littlest one will be out of primary school next year! Every time we have an outbreak of lice I just tell the other parents about Licefree. If you call the Licefreee people they will send you coupons to hand out and a dvd about headlice that is helpful. The coupons make Licefree about $7 at Walmart and that includes the amazing comb that Jane talked about. Their number is 800-482-4464. Just press zero for an operator. The lady I’ve dealt with a couple times is super helpful and nice. Thanks for this post! I’m in the middle of a lice recurrance after treating both my kids with a Nix type remedy, and I would much prefer something that is non-toxic and actually *works*. I’ll try either Licefreee or Cetaphil. Hopefully I won’t have to try both. I also appreciate your comment that “Having lice is as morally neutral as having the common cold. Or, it should be.” Amen. Both the Licefreee and Cetaphil treatments are still time-intensive, just so you know. The Cetaphil one requires the least yanking, though, so if you have little ones, that’s nice. Licefreee! uses Natrum muriaticum (Sodium Chloride) and it appears to work. If you want natural treatments rather than commercial shampoos, you can use olive oil for adult lice and vinegar for lice eggs. Hi, Paula. Thanks for weighing in on Licefreee! It worked for me, in combination with the combing, combing, and combing. I tried the olive oil treatment, combing it through kids’ hair and then bagging their heads: no luck. I don’t recall if I ever tried the vinegar, but, honestly, my feeling is if insecticides like Nix won’t kill them, what’s a little vinegar to those hard egg cases? 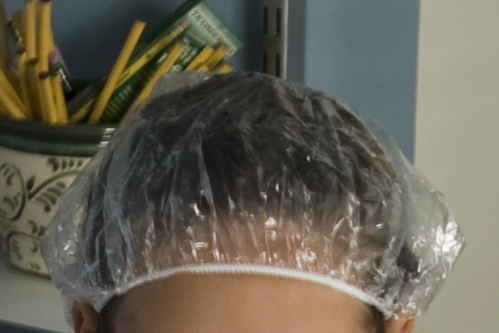 With head lice building resistance to most of the pesticides used to treat them in the past, and the idea of using a pesticide on a childs head really wasn’t that appealling when they did work. Essential oils have been looked at with some optomism, as a treatment with potential, but I agree that Lice Freee seems to be the best choice. There are a plethera of natural home remedies that work with various degrees of success, but one thing they all have in common is that there is no one shot 10-15 min solution. It is a long drawn out treatment. There are some new over the counter remedies that do promise easier and faster solutions if used according the instructions. Some of these even make the lice and nits glow so there will be less chance to that some nits will be missed. Of course there is one fast 100% effective solution- the GI hair cut. This would not be pouular with most kids. I used a 50% solution of rubbing alcohol. I repeated the process a week later. It worked waell for me.